Despite security detail at 700 Jewish institutions, 1 in 3 stay home after Friday attack; students say they are afraid for their lives. As much as 30-40% of France's Jewish schoolchildren stayed home Monday, Channel 10 reports, on the first day of school after Friday's attack on a kosher supermarket in Paris. France has deployed nearly 5,000 security forces and police to protect the 700 Jewish schools in the country this week following the attacks, according to special instructions from Interior Minister Bernard Cazeneuve. Students arriving at school saw policemen or soldiers guarding the entrances like a military base, sources told the Israeli media; some schools, such as the Lubavitch (Chabad) elementary school in the 19 arrondissement, were guarded by a full squad of French soldiers on a 24-hour watch - after concrete threats were made against it and shots were fired. At the Pardes Hana school, security has been heightened, and students were asked to present a passport at the entrance. Police is conducting regular patrols around the clock near the school and a police car is parked outside the building at all times. The school's principal told Channel 10 that the terms "life" and "death" mean nothing to children at the elementary school level, and that it is netter to tell them that God will lead them to their proper destiny. However, students have not stopped talking about death, he said, with students saying they are afraid of being attacked and expressing fears that their relatives could be murdered. 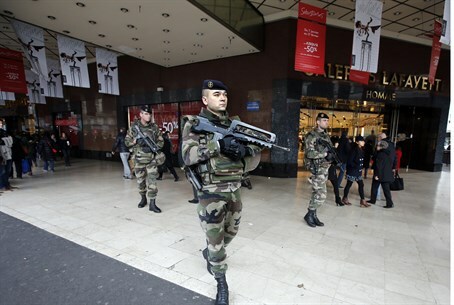 Security is high at synagogues, where "policemen with guns drawn" are already stationed following Friday's attack at the Hyper Cacher store in southern Paris.